As a law firm, each of our immigration lawyers needs to stay up to day on immigration information in the government. In turn, we want you to stay informed as well. On February 20, 2017, the Department of Homeland Security released two memos regarding President Trump’s recent Executive Orders on immigration. Secretary John Kelly outlined how he would direct DHS resources to work toward implementing the president’s goals. In the memos, Secretary Johnson directed ICE to hire an additional 10,000 agents in order to help with enforcement of the President’s directives. He also outlined which removable aliens should be prioritized by DHS. In doing so, he added a new category which is any removable alien who has “abused any program related to receipt of public benefits.” This is a new category of prioritization for DHS which seems to be directly related to President Trump’s statements about illegal immigrants in the United States. In Secretary Kelly’s Memo titled, “Implementing the President’s Border Security and Immigration Enforcement Improvement Policies” he laid the groundwork for the ability of DHS to quickly remove many undocumented immigrants currently living in the United States. 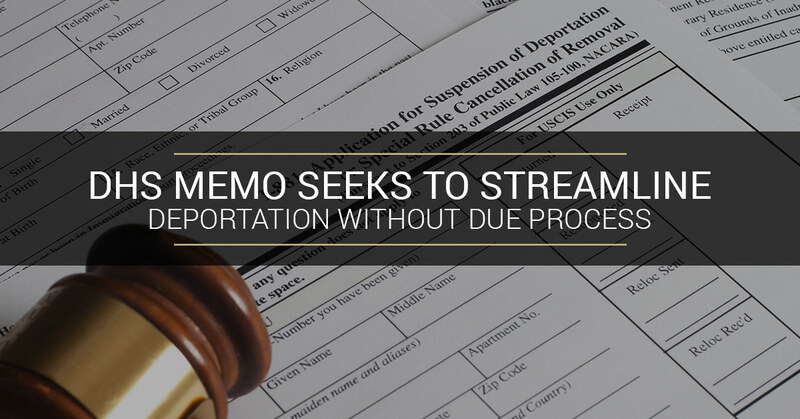 The memo states that DHS will be issuing a rule in the Federal Registrar seeking to expand the current category of people eligible for Expedited removal. Expedited removal is a process in which immigration officers have the power to deport an undocumented person without having to refer the case to an immigration judge or start formal removal proceedings. Furthermore, the person being removed does not have the right to an attorney and can immediately be put on a plane and sent home. Since 1996, expedited removal was limited to those entering the United States. Border Patrol agents had the authority to efficiently remove those trying to come into the United States without a visa or a valid reason for entry. This was needed to help ease the backlog in the immigration courts. In 2004, there was a minor expansion of this program. DHS broadened expedited removal to include those who had been in the U.S. for 14 days or fewer and were apprehended within 100 miles of the border. While it is still unclear who will be affected by an expansion of expedited removal, it continues to be an unprecedented move to try and quickly deport a larger number of people without affording them their day in court. Stay tuned to Zohar Law to get the latest developments on this and all other immigration information matters. If you’re dealing with any immigration issues, then contact an immigration lawyer today.